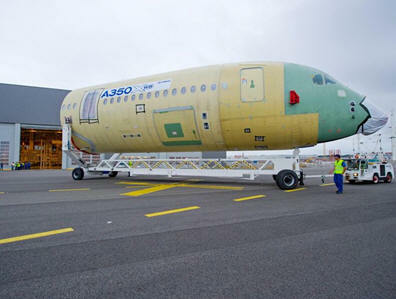 July 23, 2012 - Airbus has delivered the front fuselage for the first flyable A350 XWB (MSN1) to the Final Assembly Line (FAL) in Toulouse (France). The impressive 21 meters long section is already equipped with its systems and was flown in from Airbus’ site in Saint-Nazaire (France) by the Airbus Beluga transport aircraft. The A350 XWB front fuselage section will be mounted in the giant assembly jig ready to be joined with the center and aft fuselage sections over the summer period. Before they are arrive at the FAL, the aircraft sections are equipped and pre-assembled at Airbus sites in the United Kingdom, Spain, France and Germany. All these major sections are transported to the FAL by the Beluga aircraft. The Airbus A350 is a family of long-range, wide-body jet airliners under development by European aircraft manufacturer Airbus. The A350 will be the first Airbus with both fuselage and wing structures made primarily of carbon fibre-reinforced polymer. It will carry 250 to 350 passengers in three-class seating, depending on variant. The redesigned A350 was marketed by Airbus as the A350 XWB, where the XWB stands for Extra Wide Body. The launch customer for the A350 is Qatar Airways, which ordered 80 aircraft across the three variants. Development costs are projected to be US$15 billion. The airliner is scheduled to enter airline service during the first half of 2014. As of 20 January 2012, 561 orders had been placed for the new aircraft. The Trent XWB family comprises two basic engines to power the three A350 variants. The baseline 370 kN (83,000 lbf) thrust version for the A350-900 will be derated to 330 kN (74,000 lbf) and 350 kN (79,000 lbf) for the -800, while an upgraded 432 kN (97,000 lbf) thrust version will power the A350-1000. The higher rating 432 kN (97,000 lbf) engine will have some modifications to the fan module - it will be the same 118-inch diameter but will run slightly faster and have a new fan blade design - and some increases in temperatures brought by new materials technologies coming from its research programs. The basic 248 t MTOW -800 will be offered with a 330 kN (74,000 lbf) sea-level-thrust rating, while the 279 t MTOW option will have 350 kN (79,000 lbf) thrust. Airbus also plan to offer a 'hot and high' rating option flat-rated at 350 kN (79,000 lbf) at higher altitudes and temperatures which uses the full capability of the -900's 370 kN (83,000 lbf) thrust engine prompted by the operating requirements for Middle Eastern launching customers Qatar Airways, Emirates, and Etihad.